Impractical Jokers - The Cranjis McBasketball World Comedy Tour tickets at The O2 Arena, London. 2019. 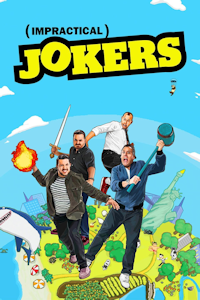 Find the best Impractical Jokers - The Cranjis McBasketball World Comedy Tour comedy tickets at The O2 Arena, Outer London. New York-based comedy troupe, whose four members are the creators, executive producers, and stars of truTV's hit series, "Impractical Jokers". Impractical Jokers - The Cranjis McBasketball World Comedy Tour tickets: The tabs above allow you to select between links to suppliers and date searching. Click on a supplier's logo to see their details and on the 'buy now' button to see and check the tickets on offer.